Cousin Crystal taking me to Rimsky's for dessert (she got a vanilla steamer (milk). . . And I was naughty and got this decadent raspberry and chocolate creamy to die for--can't explain it dessert. And hot chocolate. And then the cheese--let me not talk about the calories consumed on my day of birth celebrations. And can you see the hair cut? ?--yet another birthday present. This one from my cousin Kayleen. Swirly chunks of dark chocolate, fresh raspberries, cream, sugar--all floating together in even more whipped cream. Tyler was not to get me a boxed gift--a ticket to Utah was present enough. But when this little jewel of an Anthropologie came out of the back seat of the car, I was thrilled. Yes, I loved this. And yes, T picked it out himself. Looked for bright colors, he said. . . My favorite little lemon cake in the world--it's about 5 inches in diameter and every single bite is heaven on earth. I wish there was a New Season's Market on every corner. Favorite part of the day: Sitting in the temple talking with my Heavenly Father about His goodness in my life and feeling that He knew I was there, in His house, on my birthday. Faith is always pointed forward . . .
"It is possible that Lot’s wife looked back with resentment toward the Lord for what He was asking her to leave behind. We certainly know that Laman and Lemuel were resentful when Lehi and his family were commanded to leave Jerusalem. So it isn’t just that she looked back; she looked back longingly. In short, her attachment to the past outweighed her confidence in the future." Clear the throat and ouch! Was Elder Holland talking to me? Somewhere along my path in life, I got disappointed by my anticipation of future events that ended up going . . .not as planned? So in order to protect myself from disappointment, I started worrying about the possibilities of the future, holding on to the past, and waiting to see if things would be okay before I got excited. Sounds kind of pessimistic. And adultish. And lacking faith. Maybe that's why I've felt this need to really live this year. 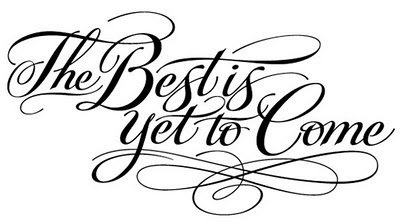 Could it really be that the BEST is yet to be? That's exciting! -My mini Spring Break trip to U.T.A.H. -Making family home evening games, lessons, etc, for my files. -Etc. I could go on. Anticipation rather than fear. Like an African Elder once told me, look forward ever, backwards never.